Pink has always been an eternal favourite colour for women and girls! Infact, you would be shocked to hear if a girl says she dislikes Pink! This pretty colour symbolises feminine beauty, delicateness, cute, charming, playful and of course, sweetness! We are sure all of us, as women love to associated with at least one of these characteristics. This is why we bring to you in this article, the latest and trending 20 Pink Colour Saree Designs! By the way, have you ever heard a lady say, she has too many pink sarees? No, right! Let’s hop on and choose our favourite picks! Pink is a universally accepted and loved colour by women! Especially Indian women love to get dressed in this lovely hue by wearing a Pink Sari. The freshness that these outfits offer is unmatched to any other colour. From day events to weddings, pink sarees can make you shine without making putting in many efforts. Whether you have a fair skin tone or dark-skinned, Pink sarees can elevate your beauty to a whole new level! Darker and vibrant shades of Pink can be attained by blending the basic pink with violet, blue, red or purple. These sarees are come with a variety of embellishments to suit various occasions. Pink saris are suitable for all segments of women. From a teenager to a middle-aged woman, these lovely drapes can make any person blush! While women between 20-40 usually pick the light-weight, transparent fabrics, the stiffer varieties are chosen by elder women. If you like sporting pink saris, then the best ones in this article are discussed below and you will hopefully like them. 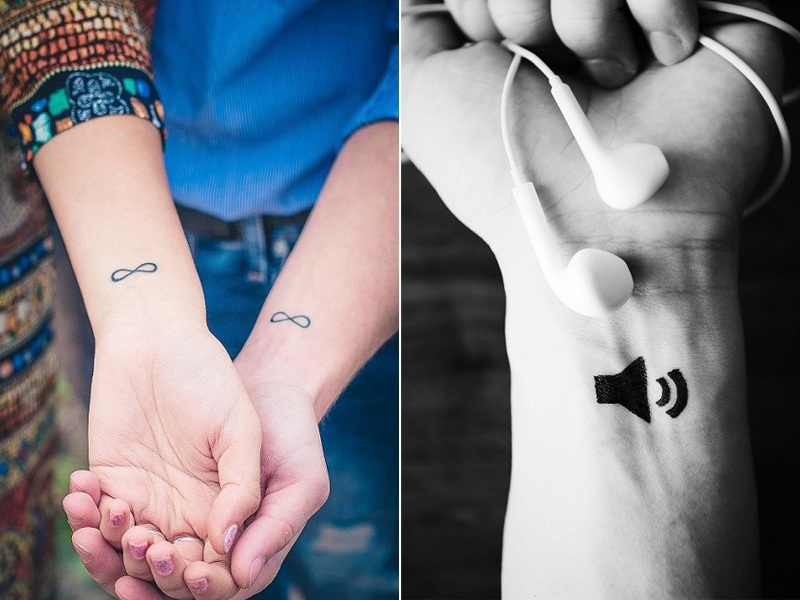 Want to get a dainty look? Check out this plain linen sari in light pink. This is one of the best attires for hot summers of India. The breeziness of linen, with the pleasant pink shade, makes it a pretty piece. A silver border woven with the linen threads renders a pretty shine to the saree. This is another breezy cotton saree in Pink, that is given a contemporary twist. The pink body of the saree is contrasted well with Pink and Dark pink borders. The unique feature of the saree is the embellishment of colourful pom poms on the border and Pallu. The end of the pallu is adorned with pretty tassels for a graceful look. Deepika Padukone is known for her effortlessly stylish fashion choices. She paints a pretty picture in this Bright Pink Georgette sari embellished with golden thread work. The vibrant shade of this saree reflects on her skin tone to make her look even more beautiful. A heavy embroidered elbow sleeves blouse elevates the look! Florals are back in vogue! They offer a fresh look even in the most humid weathers. This dainty, pastel pink floral printed saree gives you the illusion of a fully bloomed garden. The saree comes in a light-weight material for style and comfort. It is best paired with a pink and maroon blouse and floral inspired accessories. Shaded sarees are the best way to showcase the beauty of a colour! This light and dark pink shaded chiffon shari is a master blend of the two shades juxtaposed with each other. The result – a stupendous looking saree, which is an epitome of simplicity and grace! The border of the saree is embellished with pink shimmer for a subtle shine. This Pink Traditional saree is the first place on this list and for all its unique features it is the best saree you can wear. 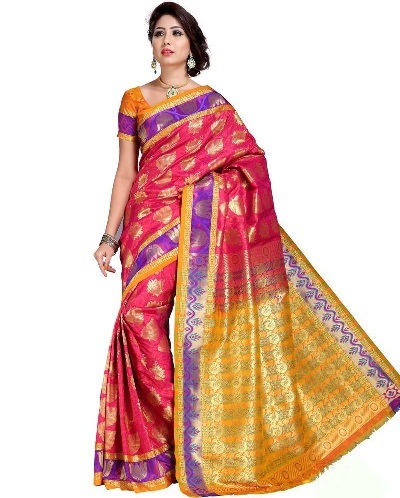 First of all, it is a silk saree which comes with the application of the deep pink color. Other than that, the golden strap pattern done on it on the borders is one of the main attractive features about this saree and that is why it can be sported easily with a good-looking golden color silk blouse. This saree can be sported at a party and other occasions such as festive events, birthdays and other family events, etc. Similar to the previous one, this hot pink saree comes with a golden strap pattern done on the borders and this is why people will find this saree quite eye-catching and will keep staring at it for quite some time. The saree also sports small golden patterns throughout the body, which is the second best feature of this saree. Women who get their hands on this particular designer item are extremely lucky. This is yet another stylish pink saree which also somehow follows the same tradition of being designed and beautified with the golden color. The small golden patterns throughout the saree and on the borders are very alluring and almost everyone will fall in love with this designer material specifically for that particular reasons. If you are willing to sport the best pink saree with faux georgette material, then this is the best one you can avail till now. The base color of this sari is pink and the designs on the edges or the border portion are done using golden color. The prime material of this saree looks like a pink one mixed with a little magenta and one will totally hear the beauty of this design. If you are willing to sport something that will attract everyone and will catch all the looks, then this saree would be the ideal styling partner for you that will beautify you wherever you wear it. The saree will go hand in hand with a golden or a magenta color blouse. After you get your hands on this saree, you will be sporting the best pink saree on the block. The beautiful pattern done on this saree using the white and silver color is very attractive, and almost all woman will happily sport this designer item on their body. After discussing a lot of pink and golden designed sarees, when you get a view of this beautiful faux georgette saree mixed with pink, you are relieved. The pink pattern done on this saree is quite eye-catching and the borders are done with a mix of more than one colors and follows more than one particular pattern. This particular saree will be suitable for halter neck blouses. The saree sports the black color with the golden pattern and the pink color on the upper portion makes this clothing item look totally ravishing. A golden print on the pleats complements the golden shimmer border that runs through the sari. This particular pink designer sari comes with a good-looking pattern done on the upper and the sides of the saree using the color black and that is what will attract all the looks in the first place. The black shimmer blouse matches the border of the saree. Wear with black lace accessories to grab everyone’s attention. This particular baby pink is so amazing that it can be sported almost everyone between weddings to birthdays. The unique attachments on the borders make this look even more alluring and that will be one of the prime factors why women will be totally excited to see this saree. Want to sport a pink saree at a respectable party? Why not take a look at this one given below? This saree follows a golden like design on the Kalki and the rest of the saree sports the sober light pink color. It will be totally suitable with a full sleeve blouse. This saree is best paired with golden accessories to shine like a star! If you are one of those few women who like to sport the designer stuff at wedding occasions, then you should consider yourself lucky as this saree is here to make you look beautiful. The border comes with unique lace work, combined with traditional Zardosi embroidery. Wear it with contrast blouse to look amazing! Here we have one of the finest looking pink and blue saree of all time. The pattern that this particular saree sports are very attractive and almost any women will prefer wearing this beautifully finished outfit. The highlight of this saree is the Banarasi style blouse which is embellished with matching borders. 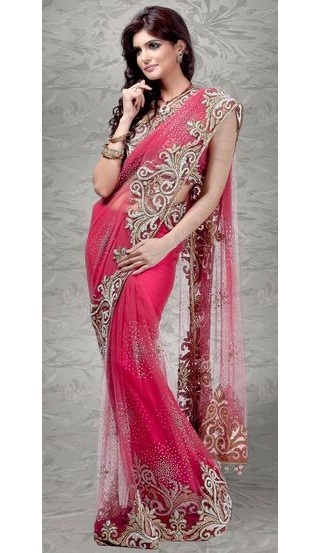 This particular party wear net saree sports the color pink and a woman can sport it at a wedding event. The netted saree is heavily embellished with lace work on the border. The body of the saree is given a shimmer touch with small stone work. Wear it with a well-fitted blouse to look sensuous. This is one of the finest-looking pink sarees of all time that comes with such a beautiful color. You will be totally fascinated by the way this saree looks and the floral pattern on the borders is also quite attractive as well. This saree complements a slim body very well and can help you flaunt your curves. This dark pink saree sports the material of a pattu saree and this is why it can be claimed to be one of the best-looking wedding sarees of all time. The bright pink hue of the saree is perfectly contrasted with the mustard yellow on the Pallu. The border is designed in violet to elevate the overall beauty! How To Style Pink Sarees? Wear light shaded pink sarees for day weddings, mehndi functions and sangeeth events. Fuchsia pink, Magenta Pink can make you look stunning in large gatherings. You can try wearing gold and silver-based accessories to look elegant. Chokers, Kundans and Polkis, are also a perfect match for a pink saree. Wear a netted cape on your georgette or chiffon pink saree to look stylish. Sport a matching pink shaded lipstick to get under the spotlight. Opt for floral headgear to add a contemporary touch. We hope these 20 Pink Saris have made you fall in love with your favorite colour all over again! These attractive drapes are designed to cater to the requirements of every woman. Right from a Bollywood inspired plain chiffon saree to the latest designer outfit, pink sarees come in a wide array of options. If you are not done with having pink sarees in your wardrobe, we shall not stop you! Go, girl! Go and find your soulmate in these stunning sarees! ← Previous Story Pochampally Cotton Sarees For Every Handloom Lover!